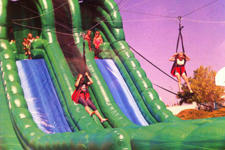 Now you can bring the hottest thrill seeking ride in the industry to your event. Be the first to offer the two lane zipline at your next big party. Your guests will be amazed and thank you! This is a great attraction for any large event including county fairs, festivals, music concert, college and corporate events. Our amazing New Amazon Zip Line gives you a adventure of your life by propelling down the Amazon for a thrilling, mind blowing experience. At 70 long and 36 high everyone will get a rush out of it. ExperienceIt today.